Providing information on a service offered by the library: details or interesting insights, modifications to previous service, new tool or utitlity…and informing how it affects the user. Healey Library is sponsoring a fine amnesty program until further notice. What does this mean for students? All fines on regular items from Healey Library’s circulating collections (books and DVDs) will be forgiven upon the return of the item(s) to the library! The removal of fines will also result in the removal of any holds from a student’s WISER account. The Library’s system of Course Reserves and recalls, as well as its circulating laptop collection, is set up to provide equitable access of Library materials and resources to all of our patrons. Late returns create difficulties for other students, faculty, or staff and so are not eligible for amnesty. Fines and holds on accounts will continue to be applied to late course reserve items, recalls, or laptops. These fines and fees cannot be waived. For questions related to library fines and fees, please email Library.Circulation@umb.edu. Faculty, submit your reserves requests today! The deadline for submitting library reserves requests for Winter and Spring 2018 is Friday, December 15, 2017! Why the compressed deadline? Because UMBrella is coming! You may have heard that Healey Library is in the process of transitioning to a new library system—one that will culminate in the launch of UMBrella, our new library search and discovery tool, at the end of January 2018. While we are executing this system migration, our ability to perform reserves processing will be frozen for a short period of time. In order to work around this freeze, please submit your reserves requests for Winter and Spring 2018 by Friday, December 15, 2017. We cannot guarantee that any requests submitted after this date will be available for the start of the Winter and Spring semesters. This includes requests for the purchase of new materials, transfer requests, and the removal of materials you will no longer be using. Requests received after December 15 will be processed and added to the new system after February 1, 2018. New purchase requests will be reviewed on a case-by-case basis, and as always, we strongly encourage faculty to utilize open educational resources (OERs), subscription resources available through the Library, and personal or review copies of textbooks to place on reserve. Personal copies of books and DVDs can be dropped off at Healey Library’s circulation desk on the second floor by completing a short form anytime the library is open. You may also submit requests via our online Reserves Request Form. Email any questions to library.reserves@umb.edu. Find more details on the Reserves Policy Page. Thank you for your patience and cooperation as we prepare to explore exciting new library frontiers together! The staff of Healey Library wish you all a smooth and productive close to the semester! As you know, one of the major expenses students incur in college is on textbooks and other materials for class. To help students cut down on schooling costs, universities and community colleges across the country have embarked on programs to replace textbooks with Open Educational Resources (OER). These are resources that are available at no or little cost to the student. In addition to adopting OER content, faculty members can build on existing OER content as well as create new content to meet their teaching and pedagogical needs and give back to the open education community. Put together a large team with diverse strengths, and delegate accordingly. Collaborating is time- and labor-intensive, but an extremely fruitful endeavor. Getting buy-in from participating ENGL 102 professors was probably made easier because we worked so closely together. In fact, we heard from more than one professor that they were impressed with how much reflection was built into the lesson! While your study may change drastically over time, it still helps to have a research design document that is updated as needed. Don’t try to assess too many learning outcomes at once! We only had 3, which still resulted in a lesson plan that packed too many things into too little time and a booklet that the majority of students had difficulty completing in class. 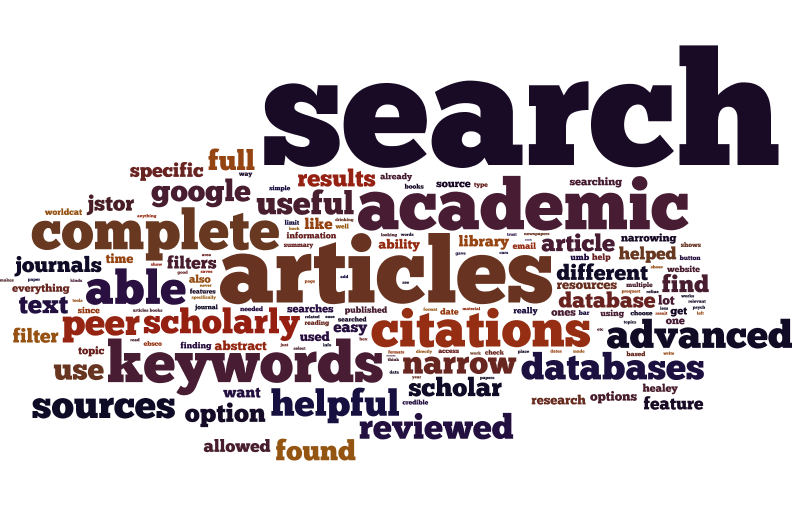 If you show students how to email articles to themselves, they will not necessarily want to write down the articles’ bibliographic information. Don’t be afraid to deviate from the original plan to address more immediate needs, if that’s what’s needed. Just remind yourself if you feel like you’re lost, that you’re not making a mess of things and to keep going, and that your hard work and frustration will pay off! Remember, you put together a good team with diverse strengths. Lean on your team and trust that you’ll learn something useful that you can use to make improvements to your program and/or your teaching. 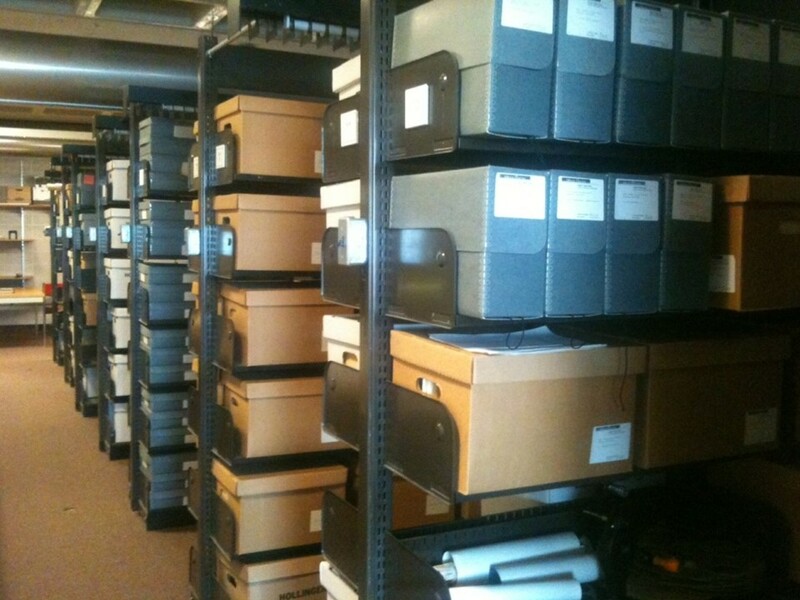 UMass Boston’s archival storage space. 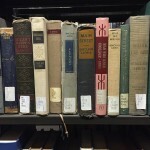 The University holds more than 200 archival collections across a variety of research areas. A single MCOF Record. Source: University Archives and Special Collections, UMass Boston. UMass Boston holds than 28,000 mortuary records from the Mass. Catholic Association of Foresters, a fraternal organization begun in Boston in 1879 by Irish immigrants. These records include extensive data about the health, social networks, occupations and immigration patterns of thousands of people over many decades. 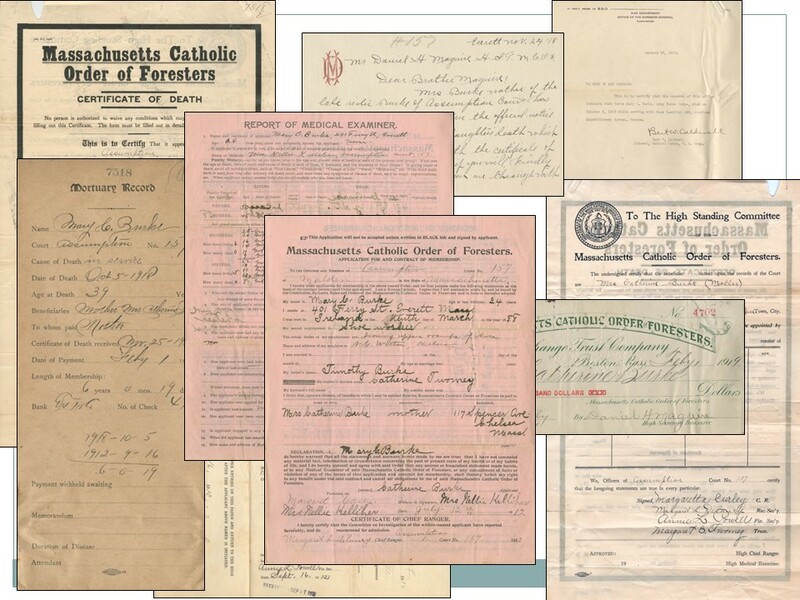 We also hold the records of the international organization “Public Responsibility in Medicine and Research”, the papers of Judge David Mazzone, who presided over the cleanup of Boston Harbor, the chambers papers of W. Arthur Garrity, who presided over the desegregation of Boston Public Schools, records of the League of American Wheelmen and many, many more organizations and individuals. 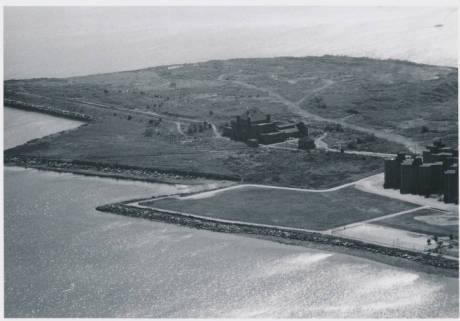 Columbia Point before the construction of the UMass Boston campus; photo taken in 1968. The building in the center is the Calf Pasture Pumping Station. Source: University Archives and Special Collections, UMass Boston. 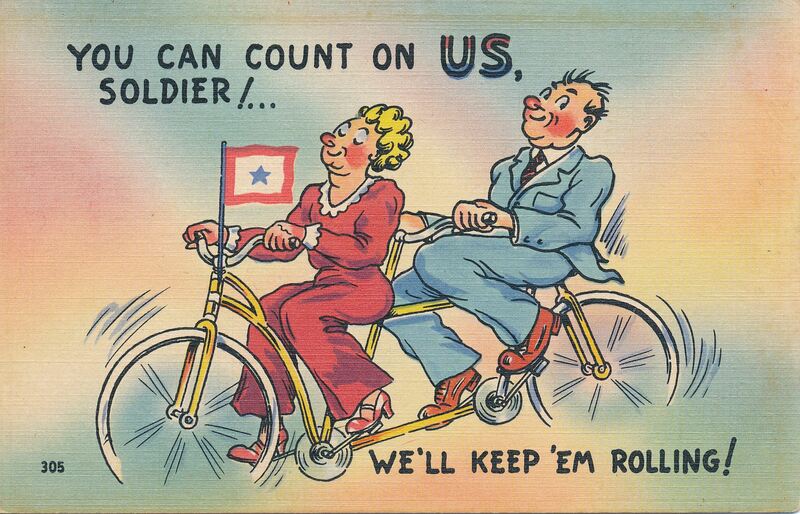 Bicycling postcard, “You Can Count On US, Solider ! We’ll Keep ‘Em Rolling!”, circa 1920-1950. Source: Archives and Special Collections, UMass Boston. Of course, no single archival institution can hold everything. Around the world, different institutions have committed to taking responsibility for storing and preserving different chunks of the historic record, usually based on that institution’s own mission and goals. There are many other archival institutions in the area and around the world, and Healey Library’s Archives staff can help you to find out what they hold and how to access them. There are also several fine, online directories of archival holdings – “ArchiveGrid” from OCLC is a good one. Another is WorldCat, where you may limit search results to “Archival Material” using the faceting options in the left-hand column. 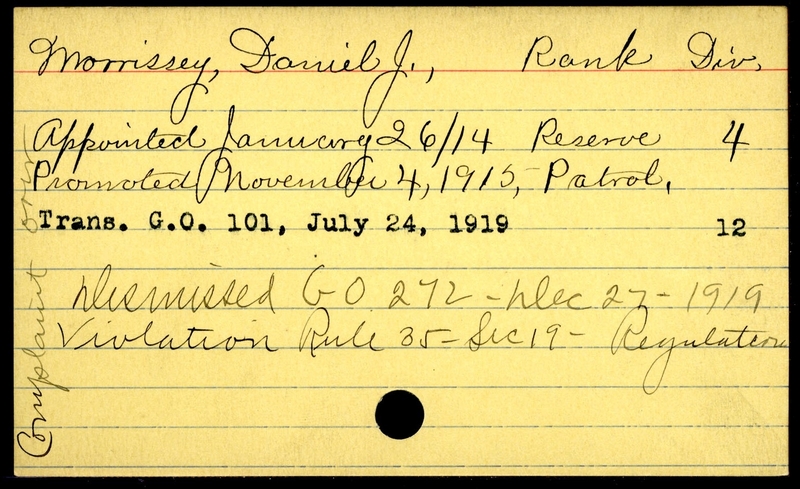 Duty roster card for a patrolman involved in the 1919 Police Strike in Boston. Source: Boston Police Department Archives; digital copies of the full set held at University Archives and Special Collections, UMass Boston. So if your research can make use of archival materials in any format, please do contact us. The staff here in the University Archives and Special Collections is enthusiastically committed to assisting you in reaching your academic and research goals. The best way to take advantage of the Archives department’s services is simply to email library.archives@umb.edu and tell us what you need or are hoping to accomplish. And you are welcome to stop by any weekday between 10 am and 4 pm to say hello and see our Reading Room and speak to an archivist. The University Archives and Special Collections are located on the 5th Floor of the Healey Library.